Fried Pizza Dough, Pizza Fritte or Placinta, European street food pan fried pizza brushed with chimichurri sauce, sour cream & cheese. 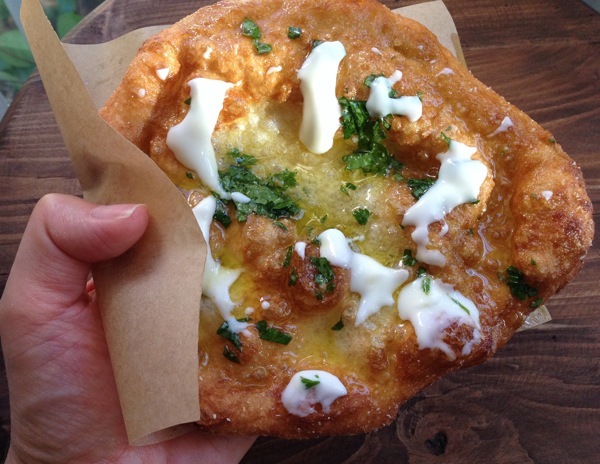 Fried Pizza dough is definitely not on my Top 10 list of healthy foods. 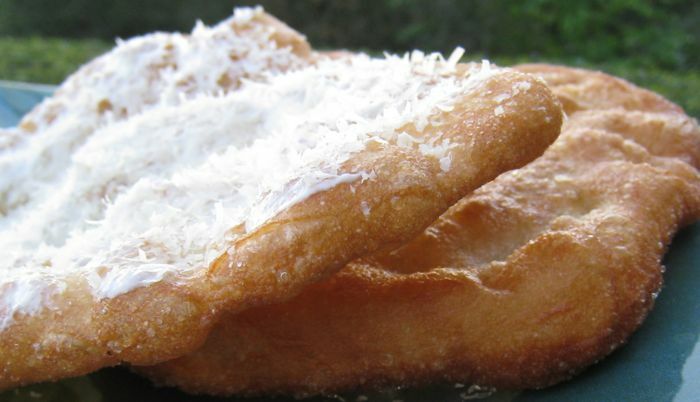 However, Fried Pizza dough, Pizza Fritte or Placinta is one of my favorite ways to indulge. The smell of fried pizza dough takes me straight back to my childhood, when I would wake up early in the morning and go to the market with my mom, just because the fried pizza shack was there. Always a long line, and the smell of garlic from the jar of the best chimichurri sitting on the ledge, absolutely intoxicating. I was particularly fond of this feather brush in the chimichurri jar. We literally brushed the chimichurri on the fried pizza dough with goose feathers. 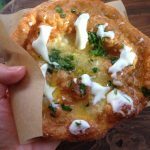 If you have never tried fried pizza dough before, it might sound a little strange to you at first, but I promise you it is one of the best street foods you will ever taste. 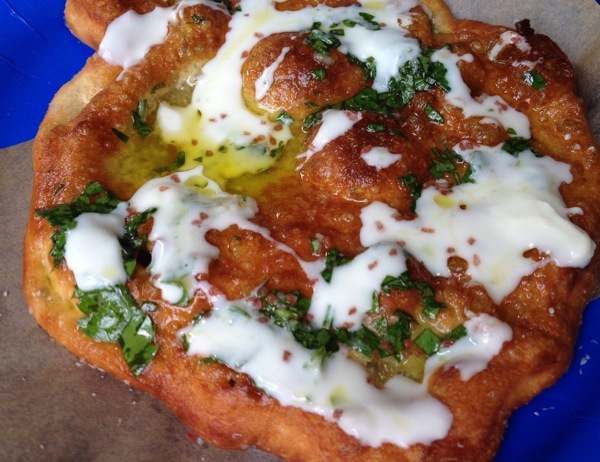 I made the simple version of fried pizza dough last night, rubbed with garlic or brushed with chimichurri sauce. Then generously drizzled or brushed with sour cream and sprinkled with lots of parmigiano reggiano cheese. 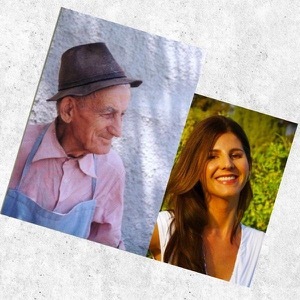 The way we used to buy it at the market on Fridays on the streets of Romania back in the day. I use my classic rustic pizza dough recipe to make all the different variations of a pie. 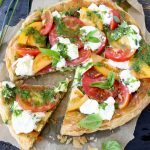 You can also make fried pizza dough Neapolitan style, by sealing regular pizza toppings between two layers of dough and frying it until golden and crispy. Or sprinkle it with powder sugar for a sinfully delicious sweet treat on the go. 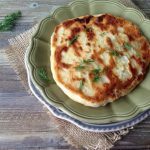 For a healthy variation you can turn it into a Savory Pie Placinta cu Varza recipe , by filling the dough with sauerkraut or mashed potatoes, just like a gigantic gnocchi. Then sear it crisp on a cast iron plate. That’s pretty delicious too, tough I must say, the fried pizza dough has a really special place in my heart. A friend of mine was in town this week, so after a long walk to Venice we decided to get our hands dirty and make our own Fried Pizza Dough. We pigged out as soon as they came out of the skillet, laughed, told stories and shared memories until we ran out of wine and fried pizza dough. Here is my simple version of this delightful street treat, and would love to hear all about it if any of you kids give it a try. Make the rustic pizza dough.Cut the dough into 14 pieces and shape them into rounds. Place them on an oiled cookie sheet and drizzle with a little olive oil. Cover with plastic wrap and allow to sit and rise at room temperature for two hours. In a 10 inch cast iron skillet heat up 1 inch of canola oil to 350″ F.
With oiled hands flatten a piece of pizza dough and then stretch it into a 8 inch rounds. Gently set it into the hot oil and allow it to cook for a couple of minutes on each side until golden. If the dough puffs up in the middle just stab it with a fork. Transfer the fried pizzas to drain on paper towels then brush it with some of the chimichurri sauce or sour cream. Grate plenty of parmigiano-reggiano on top and serve hot holding it with a tiny piece of wax paper. I remember my mom making this when we were kids, especially during lent. Good eats! Hey Mauricio, The smell of fried pizza dough brings back so many good memories. Nostalgia . Thanks Lindsay, I promise it tastes even better than it looks. Try it! Yes @Brian !! I remember those, so freaking good! We make it with pizza dough, but same idea. A real indulgence but so worth the calories !